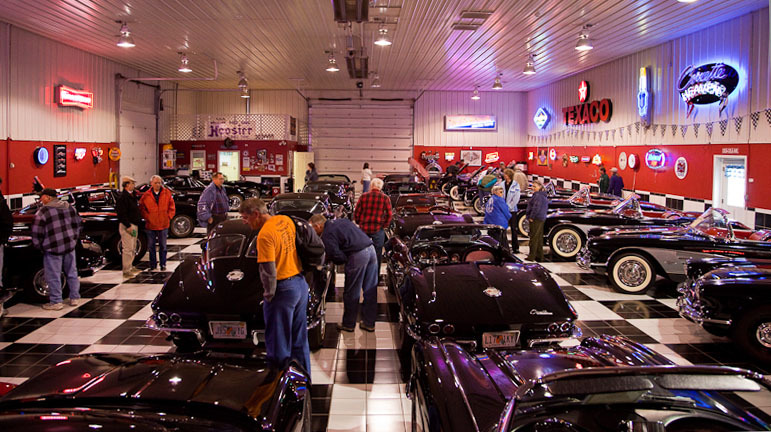 Corvette Heaven | Sanford Neon! 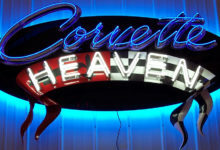 Corvette Heaven neon is the proud masthead of the finest all-black Corvette collection on earth. Rich iconic design elements are brought together with depth and flow to create this sophisticated high power neon display. 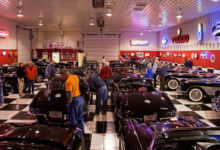 Designed and built by Sanford in spring 2008, Corvette Heaven measures 8 feet wide by 6 feet tall. With 6 distinct layers building a depth of 1 foot. 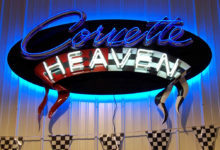 Horizon blue neon backlighting creates a blue halo on the wall behind, greatly extending the sign’s presence beyond it’s aluminum and polymer body..
Corvette script from a 1963 Sting Ray was photographed by Sanford for the sign. This style of script was used on the 1963-1965 rear deck lid and has a distinct isosceles trapezoid cross section. The Photo was reproduced as a sticker and applied to mirror anodized aluminum then CNC router cut to shape. The sticker was then hand cut with a xacto blade and the center of the stroke was removed to reveal the flat face of the original chrome badge profile.. This detail can be seen as the cobalt blue neon is reflected back to the viewer..
“Corvette” script and neon is raised 6″ & 8″ in front of the gloss black oval body of the sign. White “HEAVEN” neon reflects from mirror anodized aluminum letters. 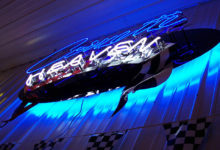 The aluminum letters are raised 1 inch above the crossed flags inspired “scroll banner”. To create 3 dimensional movement and flow in the banner, Sanford heated and hand formed pvc plastic sheet. 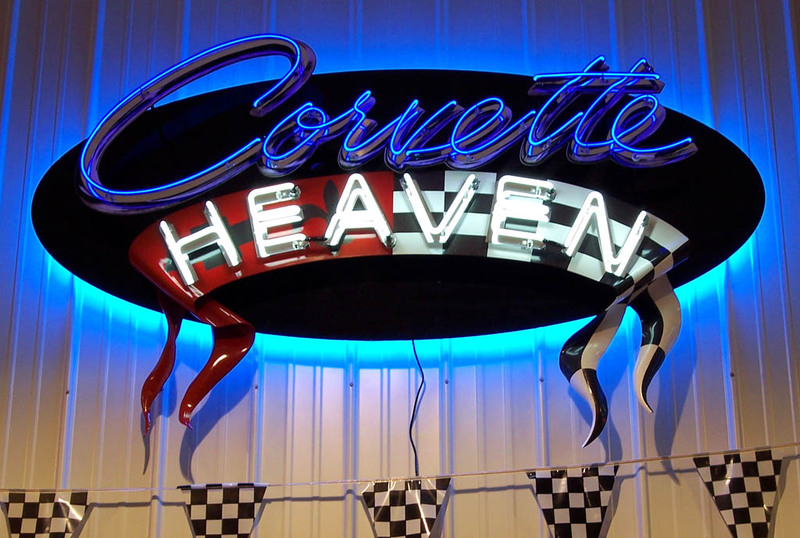 All Corvettes have crossed flags with racing checkers and Chevrolet bowtie, the earlier years included a fleur-de-lis. 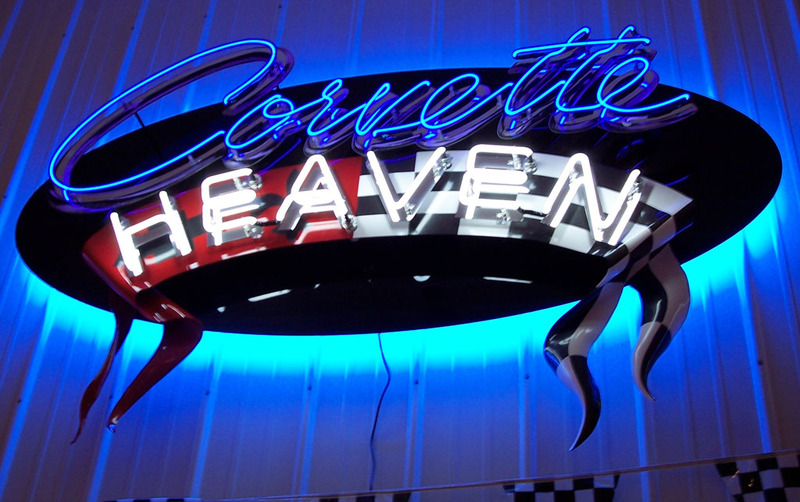 In pure Sanford style, Corvette Heaven sparkles with metallic vinyl for the black checkers, bowtie, and fleur-de-lis. 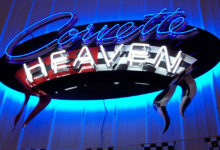 Heralding 6″ above the oval sign body, “HEAVEN” banner welcomes all who have arrived. Corvette Heaven was an enjoyable design and build for Sanford, and is one of my favorite pieces. 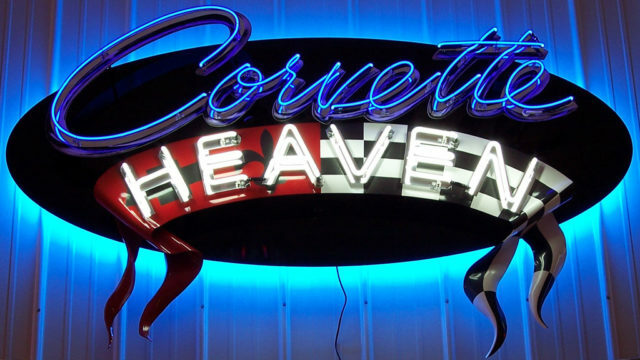 As with all celestial bodies, Corvette Heaven is truly appreciated only by those who experience it in person, spontaneously inducing rapture to the well deserved.